The Western Hemisphere on an Equatorial Projection. 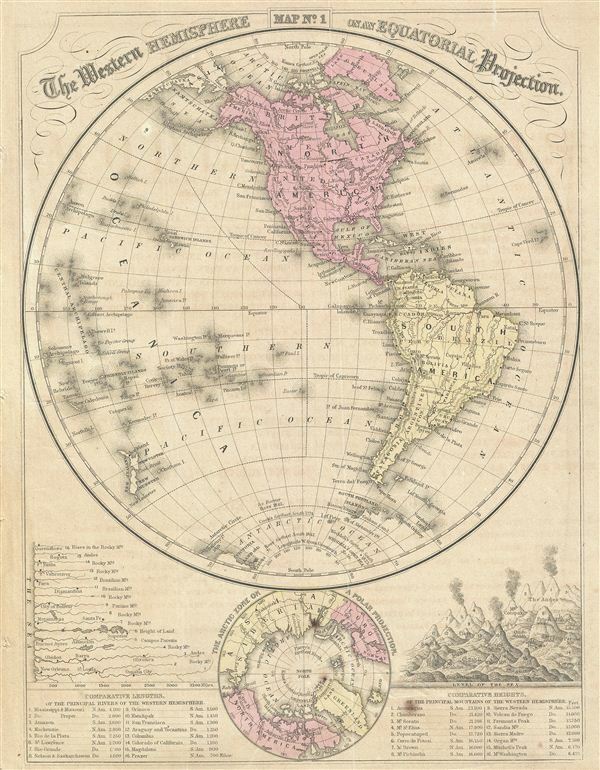 This is a fine example of the 1866 Mitchell map of the Western Hemisphere or the Americas. Offering a fascinating snapshot of the world during a period of rapid globalization and discovery, this map of the Western Hemisphere includes North America, South America and most of Polynesia. Antarctica is only tenuously denoted, reflecting the primitive state of exploration in the region. The eastern Hemisphere map includes Africa, Asia, europe and Australia. Both maps identify various cities, towns, rivers, lakes, mountain passes and an assortment of additional topographical details. Smaller maps near the bottom of each map feature the Arctic and the Antarctic Zones on a Polar Projection. The bottom left and right quadrant also features the comparative lengths of the principal rivers and the comparative heights of the principal mountains in each hemisphere respectively. The map is printed on both sides with verso featuring the map of the eastern Hemisphere. This map is part of Mitchell's school atlas published in 1866. Very good. Verso contains map of the Eastern Hemisphere. Minor foxing.